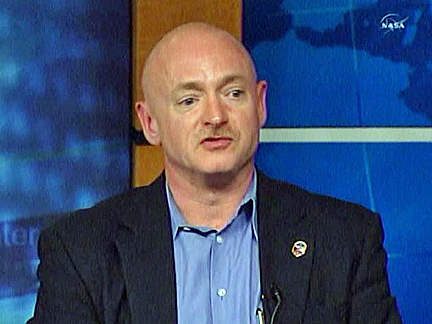 KENNEDY SPACE CENTER, FL--Just one month after Rep. Gabrielle Giffords was shot in the head in Tucson, the Arizona Democrat's husband, astronaut Mark Kelly, announced Friday that he will resume training Monday to command the shuttle Endeavour during its final flight in April, saying his wife "would be very comfortable with the decision I made." What input Giffords may have provided was not clear because "I just don't want to go into details about her condition," Kelly told reporters during a news conference at the Johnson Space Center in Houston. "Then people speculate on prognosis. It's just something I don't want to address. We had a discussion but beyond that, it's not something I feel comfortable talking about." But with Giffords making clear progress with recovery and rehabilitation at the TIRR Memorial Hermann hospital in Houston, Kelly said his wife's parents, her sister and his own family unanimously encouraged him to resume training. Asked if he expected GIffords to attend Endeavour's launching in Florida April 19, Kelly said "absolutely! I have every intention that she'll be there for the launch. I've already talked to her doctors about it. There really shouldn't be any reason why she can't go to the launch." Whether Kelly could resume training in time for Endeavour's April flight has been an open question for weeks given the severity of Giffords' wound and the demands of her recovery. With Kelly's concurrence, NASA earlier named veteran shuttle commander Frederick Sturckow to train with Endeavour's crew with the understanding that he would fly in Kelly's place if necessary. But with Kelly's decision to fly, and with the approval of NASA management, Kelly will resume mission-specific training with his crewmates Monday morning. The primary goals of Endeavour's mission are to deliver a $2 billion physics experiment to the International Space Station, along with critical supplies and equipment. "I'm very glad to be able to have Mark back as the commander of (Endeavour)," said Brent Jett, a veteran shuttle commander who heads the flight crew operations directorate at the Johnson Space Center. In the immediate aftermath of the Jan. 8 that killed six and wounded 14 others outside a Tucson supermarket, Kelly said he did not believe flying aboard Endeavour was a realistic option. "I was in the ICU (intensive care unit) in Tucson, at my wife's bedside, talking to her neurosurgeon and her trauma surgeon about her prognosis," he said. "At that time, my thought was that I very likely would be sitting in that same seat maybe two, four, six months later, in that ICU, by her bedside. The doctors thought that was certainly a possibility, probably likely. As she progressed day to day, it started to become evident she was not going to be in ICU, maybe not even in two weeks." Defying the odds, Giffords quickly gained strength and Kelly was able to move her to TIRR Memorial Hermann in Houston, a widely respected facility with expertise in recovery from severe head wounds. With Giffords undergoing rehabilitation relatively close to home, and with an extensive support network that includes immediate family members and close friends, Kelly began thinking about the possibility of rejoining his shuttle crewmates. "She's made progress every day," Kelly said. "So about two weeks ago, I started going through the process myself of what would I need in order to get back with my crew to continue training for STS-134. This has been a learning process in brain injury for me, and what rehab is like, and after speaking to her rehab doctors and the neurosurgeons here, it also became evident she was going to be very busy. "Her days are filled, from the time she gets up at eight o'clock until after 6 p.m., with six hours of speech, occupational and physical therapy. So she's got very busy days, and meals in between. And I started to think about STS-134, about the mission, my crew, the fact that I've been training for it for nearly a year and a half. And considering a bunch of other factors, including what Gabrielle would want me to do and what her parents and her family and my family would like, I ultimately made the decision that I would like to return and command STS-134." Chief astronaut Peggy Whitson supported Kelly's decision. "Mark had to make the first part of this decision," she said. "We weren't going to ask him to command 134 unless he felt comfortable and ready to do that. In addition to feeling comfortable, he has an incredible support group, which made us more comfortable with the fact that he had folks to help him through this process and that it would make it a doable thing for him to perform the mission." Whitson and Kelly then met with Jett. "Mark had a very good plan," Jett said. "He had a routine that he explained to me, how his days would proceed and how he would be able to commit the time necessary to train for the mission. That made me feel comfortable. We also discussed with our doctors, who were in communication with Gabrielle's doctors, about the potential risk of her condition changing over the next eight weeks or so. ... We had very good answers from the doctors, Mark had a very good plan. But there was a piece I felt that was missing." NASA management needed to make sure Kelly was up to the rigors of training and would not be unduly distracted by the complexities of his wife's condition and recovery. "We wanted to put Mark's plan into effect," Jett said. "So we asked him to train this week with a schedule that would approximate the schedule he would have while he was training for the mission and put his plan into effect and see how it worked out. It also gave us an opportunity to observe Mark. Obviously, as his management it was important for us to know that he would be able to focus while he was in training and not be distracted by Gabrielle's situation in the hospital during her rehab." As part of that trial run, Kelly completed a checkout in one of NASA's T-38 jet trainers this week, participated in shuttle ascent and entry simulations and flew to Washington to attend a National Prayer Breakfast at the White House, giving him a chance to evaluate the difficulties of travel during training. "We thought we had a good process for bringing back Mark into training before we made the decision, getting the chance to observe him," Jett said. "We met again yesterday, we talked to all the individuals that had a chance to observe Mark during the week and we were able to unanimously decide Mark was indeed ready to resume training on Monday and fly as the commander." Asked about critics who might question his decision to spend time away from his wife at a critical point in her recovery, Kelly said "they don't understand a few things." "They don't know her very well, so they don't know what she would want," he said. "She is a big supporter of my career, a big supporter of NASA. She really values the mission of NASA. What we do and what the nation gets from that are very high on her list of things she really treasures about this country. So I think they don't understand that, and they also don't understand her condition or the support system that I have in place. I think if they had more details about those things, you'd probably have less people being critical. But I think in any decision there's a lot of interest in, you're going to have people on both sides." Kelly said he still feels angry from time to time about what happened to his wife and the other victims of the Tucson shootings. "When a traumatic event happens, there are those different steps that you go through," he said. "I think I very quickly got to 'angry' on the first day this happened. I can't remember what step two was, but I think I skipped right over that one. At times, I'm angry about what happened to her. ... It's really an unfortunate, tragic situation." But he said that anger played no role in his decision to resume training. "Absolutely not," he said. "What I use to evaluate whether I want to come back to be commander of this mission has nothing to do with being angry and everything to do with what is right for NASA first, and then for me and my family." Endeavour is scheduled for launch on the 134th shuttle mission around 7:48 p.m. EDT on April 19. If all goes well, Kelly and his crewmates -- pilot Gregory H. Johnson, Michael Fincke, Gregory Chamitoff, Andrew Feustel and European astronaut Roberto Vittori -- will dock with the space station two days later. Along with moving the Alpha Magnetic Spectrometer to a permanent mounting pointing point on the station's main power truss, the crew also plans to stage four maintenance spacewalks and deliver critical supplies and equipment. Assuming an on-time launch, Endeavour will undock from the station May 1 and land back at the Kennedy Space Center the afternoon of May 3. NASA managers hope to launch the shuttle Atlantis on the shuttle program's final flight around the end of June to deliver a final load of supplies and equipment to the space station. NASA's fiscal 2011 budget includes authorization for the flight and a four-man crew is in early training, but the mission has not yet been funded.